As we know, there are few H.265 Converters on the market that can encode video to H.265. To meet the H.265 encoding need, Pavtube Video Converter Ultimate is upgraded to support converting H.264, Divx, Xvid, MKV, AVI video to H.265. 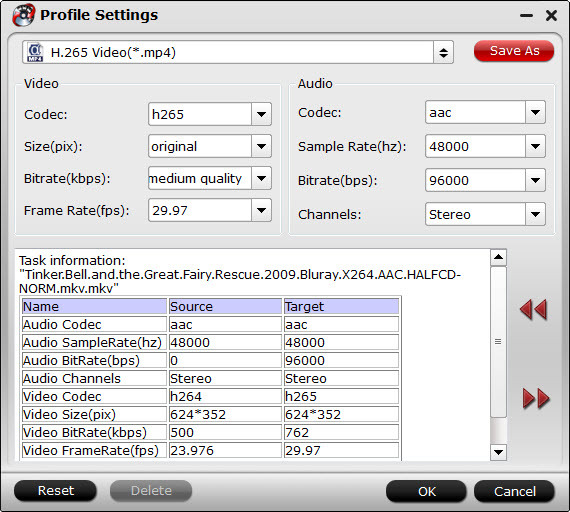 Aside from encode video to H.265, it also can decode H.265 to other video format, or extract audio from H.265. 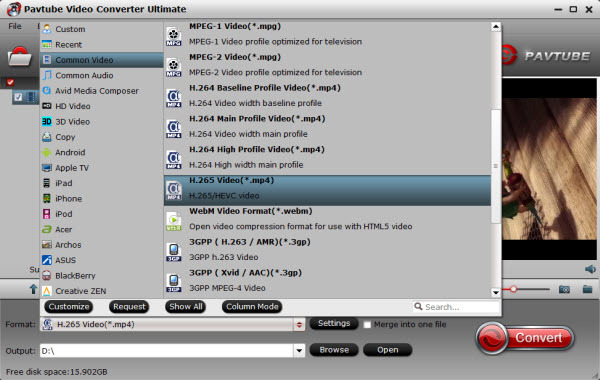 Tip: If you want to merge all videos into one file, tick the “Merge into one file” option. Click Format bar to get the format list and select H.265 Video(*.mp4) from “Common Video” Category or select HD H.265 Video(*.mp4) from “HD Video” Category. If you want to get H.264 MP4 format, just tap in the “Common Video” item, there are three H.264 codec standards, H.264 Baseline/Main/High profile Video (*.mp4), usually we can choose the High Profile MP4 as the best playback format on Windows. Apple: Apple’s new iPhone 6 and 6 Plus now use highly efficient H.265 video codec for facetime. In one word, H.265 is the codec of the future. Don’t miss our New Year deals for this updated H.265/HEVC Converter! Is that all of its features? Of course Not! It also functions as a strong performer for ripping Blu-ray, DVD to H.265 MP4 for playback.